The Spanish city of Mollet del Vallès and the Portuguese city of Torres Vedras are the winners of the inaugural European Green Leaf 2015. Read the Mollet del Vallès press release here and the Torres Vedras press release here. 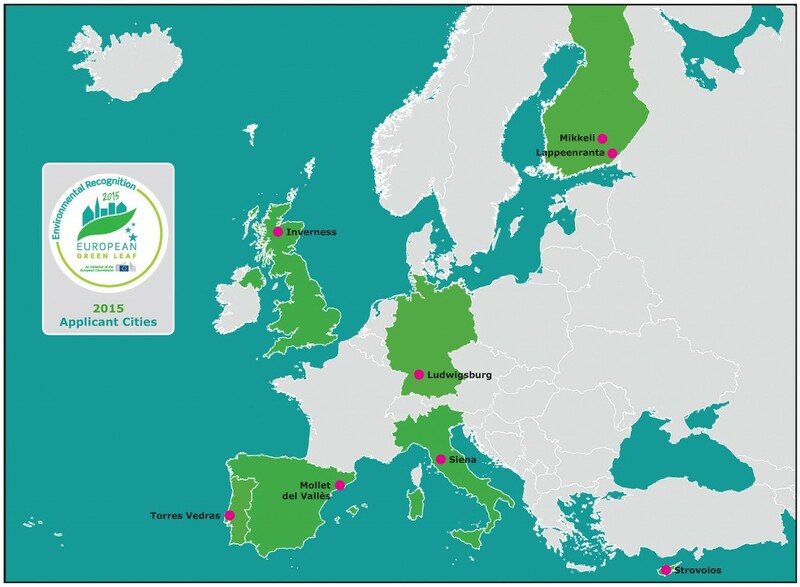 Ludwigsburg (Germany), Mikkeli (Finland), Mollet del Vallès (Spain) and Torres Vedras (Portugal) were the four finalists shortlisted for the inaugural European Green Leaf 2015. The European Green Leaf will be awarded on an annual basis by the European Commission, in conjunction with the European Green Capital Award, to recognise the special efforts made by European Towns and Cities, Growing Greener. Following a technical evaluation, Ludwigsburg, Mikkeli, Mollet del Vallès and Torres Vedras were shortlisted from among the applicants for this first European Green Leaf competition. An Expert panel undertook a technical assessment of each entry, looking at Climate Change and Energy Performance; Mobility; Biodiversity and Land Use; Quality of Air and the Acoustic Environment; Waste and the Green Economy; and Water Management (incl. Wastewater Treatment). For more information on the European Green Leaf please click here.